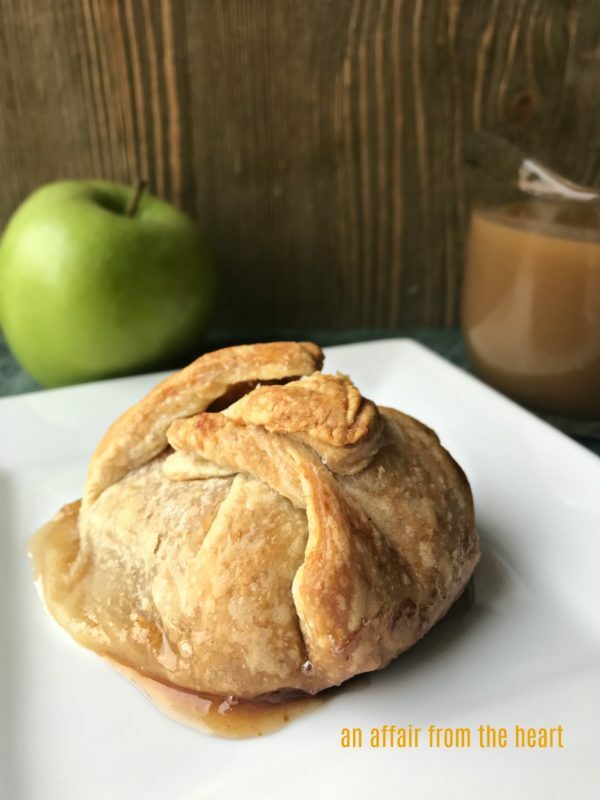 These apples are topped with butter, brown sugar and cinnamon, then wrapped in puff pastry and baked until golden brown. 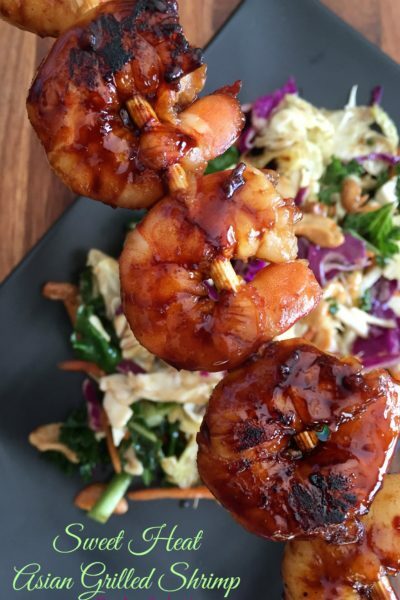 Top them off with a spiced rum caramel glaze before serving. Before you know it, Fall will be upon us. I have already seen the pumpkin recipes starting in early August! Don’t get me wrong, I love pumpkin recipes as much as the next girl, but you know what bothers me? Apple season gets skipped over WAY too quickly. Apples are one of my favorite fruits, and when they are in season, you can’t help but want to eat them like crazy! What’s even better? BAKING with them! There is nothing like the scent of apples and spices baking to make your whole kitchen smell heavenly. Last year, I made this Apple Kuchen. It became an instant family favorite! 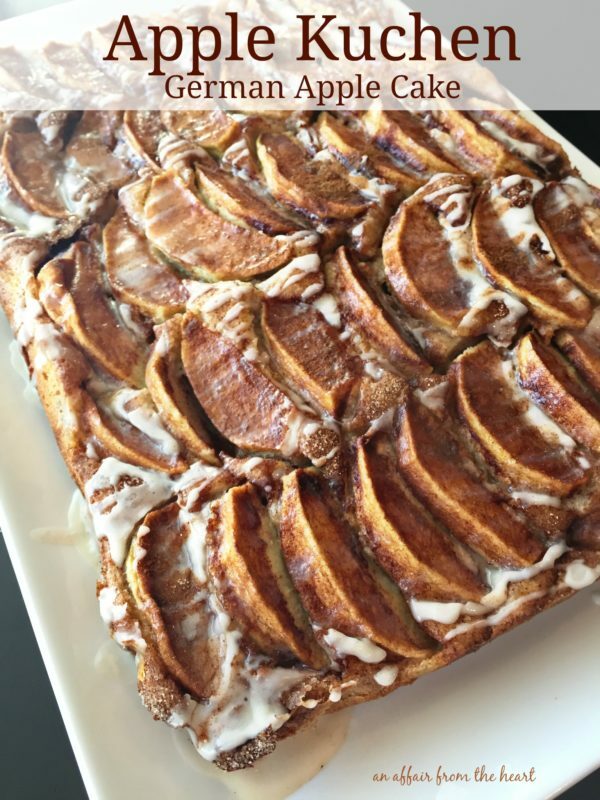 Apple Kuchen (German Apple Cake) — A traditional German dessert made of a ‘not too sweet’ cake, a layer of fresh apples sprinkled with cinnamon and sugar, and drizzled with vanilla glaze. Heavenly! 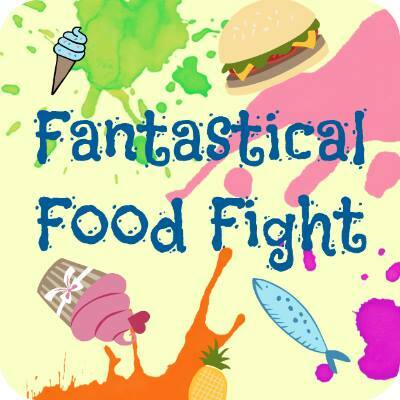 It was time again for another Fantastical Food Fight recipe. What’s that you ask? It’s a group of bloggers I joined in last month, and every month we have an ingredient or type of food challenge. Last month is it was ice cream. 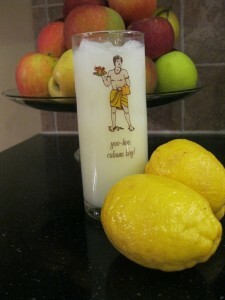 I made Lemon Ice Cream, boy was that good! This month the ingredient is rum, because today is National Rum Day! I don’t know about you, but when I hear rum my mind instantly goes on vacation. Sipping something tropical on a beach in Jamaica. So, initially I thought I would make a cocktail. But a cocktail seemed like I wasn’t challenging myself enough. Then my mind started working toward something savory. Nothing was tripping my trigger. I kept coming back to rum sauces. 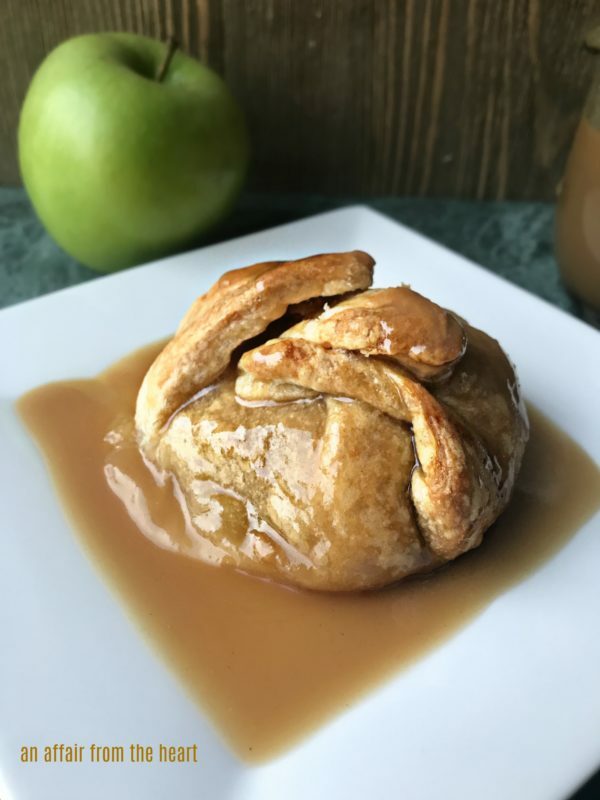 I had been wanting to make apple dumplings for a while now, so I figured doing them together would be a win-win situation. A Little back story?? If you’ve been around a while, you have probably heard me talk about my first job, at Wendy’s. Yep, I was that girl at the counter asking “Will this be for the dining room tonight?” Or taking your drive-thru order. Back in the day, Wendy’s had Apple Dumplings. They were SO GOOD. I never could figure out whey they did away with them? I tried to make the ones that use crescent roll dough, they were just okay. I love using puff pastry, so I decided that was the ticket! You need one sheet of puff pastry, cut into quarters, and 2 Granny Smith apples, cut in half, peeled and cored. Lay and apple in the center, top with a pat of butter, brown sugar and cinnamon and nutmeg. Wrap the puff pastry around the apple, and pinch to seal. Place in a shallow baking dish and brush with melted butter. Bake until golden brown. While baking prepare your spiced rum caramel sauce. Melt butter in a saucepan, and add in brown sugar and spiced rum. Whisk while sugar dissolves. Add in cream and whisk while it thickens. Plate dumpling. Give yourself a little pat on the back. It’s a perfect little bundle, isn’t it? Give it a nice pour of warm spiced rum caramel sauce. Listen to the angels sing. I took it one better. I cut into the dumpling, that flaky golden brown outside, and that warm spiced apple inside? HEAVEN. Then you know what I did?? 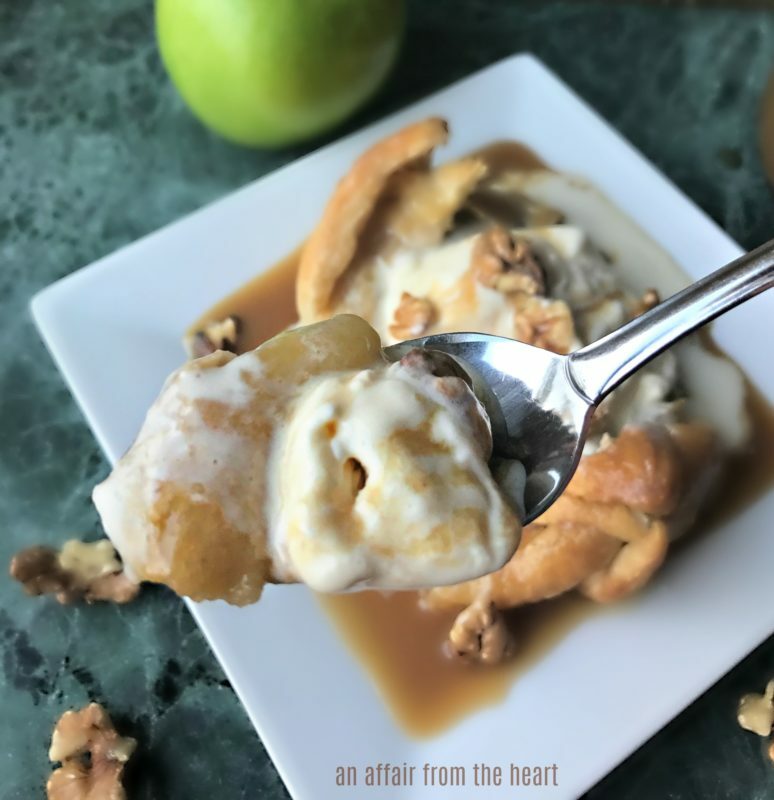 I filled that warm center with a scoop of vanilla bean ice cream and a small handful of walnuts, and just a little more of that delicious rum sauce. Dig in and enjoy. Every.Single.Bite. To make the dumplings: Preheat your oven to 375 degrees, and spray a shallow baking dish with non-stick baking spray. Remove one sheet of pastry dough from the freezer, let thaw until it's easy to work with. Roll it out slightly on a floured surface and cut into quarters. Place one of the halved, peeled and cored apples in the center of each quarter. Mix together brown sugar, cinnamon and nutmeg in a bowl. Sprinkle over the top of each apple. Top with a teaspoon sized pat of butter. Wrap puff pastry around the apple, and pinch to seal at the top. Place in a shallow baking dish. Melt the Tablespoon of butter and brush over the tops of each apple. Bake for 40-45 minutes or until pastry is golden brown and flaky. To make the Sauce: Melt butter in a saucepan, add to it brown sugar and rum. Whisk while sugar dissolves. Add in heavy cream and whisk while sauce thickens. Pour over warm dumplings and serve. **Can be topped with ice cream and walnuts, if desired. 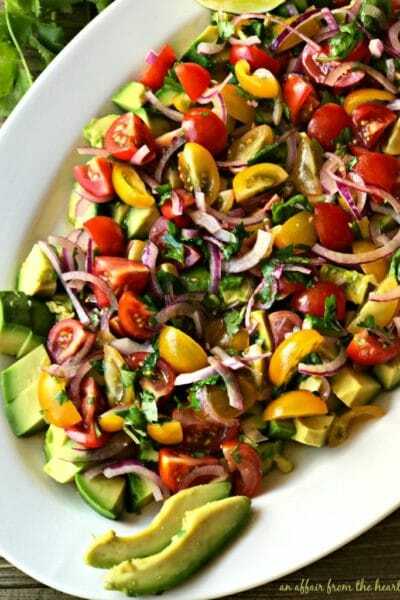 More apple recipes to love…. 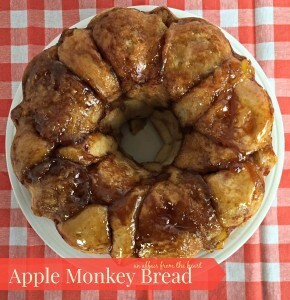 Apple Monkey Bread — This apple monkey bread is ooey gooey sticky like a sweet roll, and sprinkled with apples and all of the spice flavors of fall!! 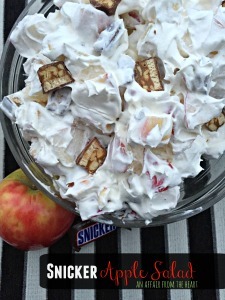 Snicker Apple Salad — Classic Snicker apple salad is easy to make with only 3 ingredients, and SO delicious! Perfect timing for this recipe with apple season just upon us. 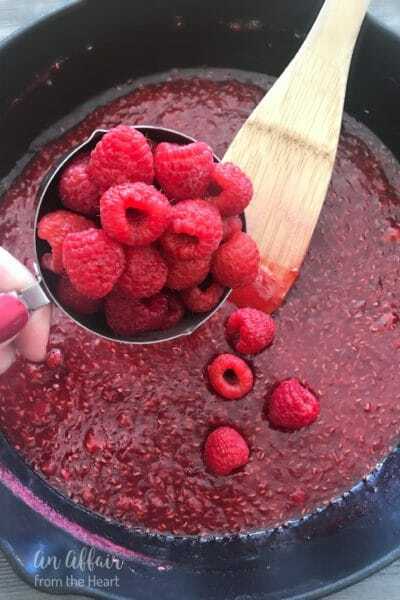 Loving this rum caramel sauce! Thanks, Wendy!! They are yummy!! Oh, my goodness gracious! I cannot wait to try this. 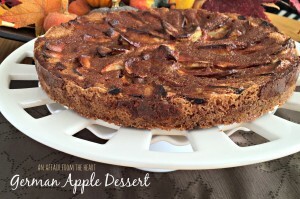 Beautiful recipe for apple season!! Now I just need to see when the local orchard opens for picking. Beautiful! I agree with you, apple season goes by too quickly. I need to make these. Wow! That looks delicious! I bet it smells amazing too! Rum and Caramel? Oh, heavens that sound amazing! What an amazing creation! And I agree, apples need more attention! I’m not the type who will pick an apple to snack on, other fruits win in this case. However when it comes to baking and desserts apples are my favourite. 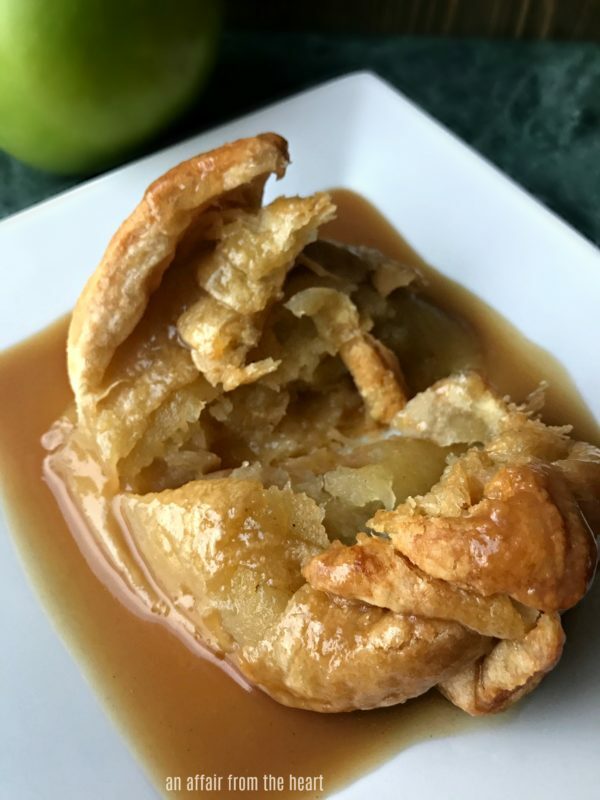 Love you apple dumplings..puff pastry + apples and a bit of rum= delicious treat. These dumplings look so decadent and delicious! I have a tree full of apples at our cabin, so this would be a perfect sweet treat to use some of those apples up! 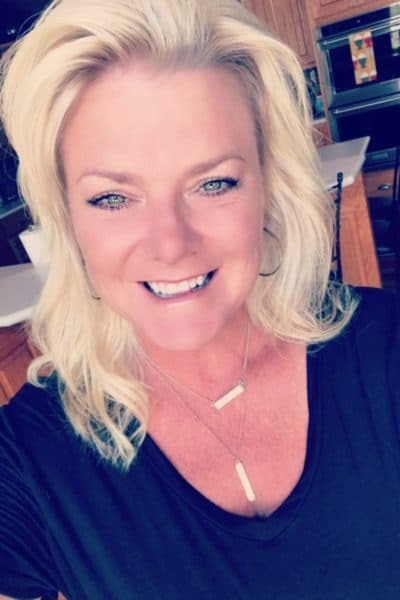 That looks absolutely fabulous, Michaela! I’m all about fall treats and I’m on pins and needles waiting for summer to officially be over because I NEED ALL THE FALL THINGS! 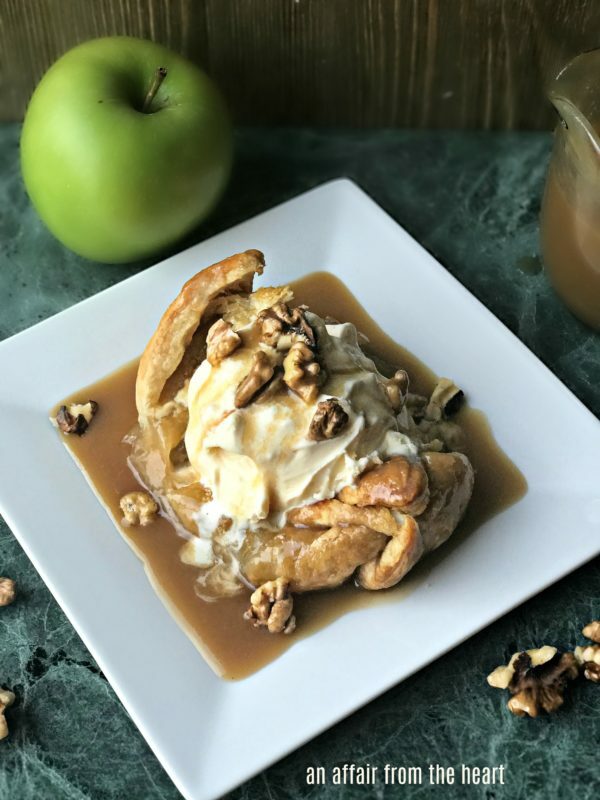 Apple caramel and pumpkin everything 🙂 The walnuts and ice cream on top with the rum sauce – yummmmm! 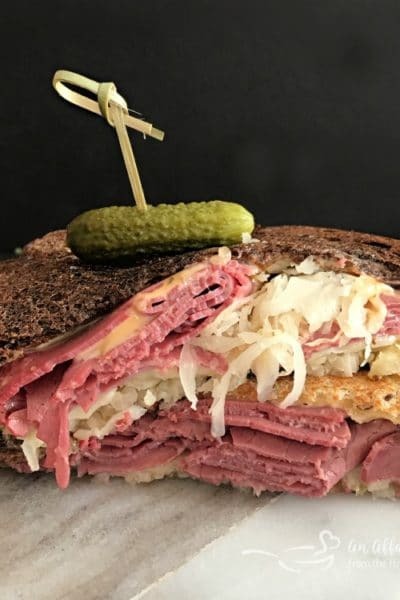 This recipe is SO on my list, Michaela! I had some last fall, and have been thinking about them ever since… We’re gonna love your recipe!! I have puff pastry and Captain Morgan rum. Go figure no apples (haha!) . 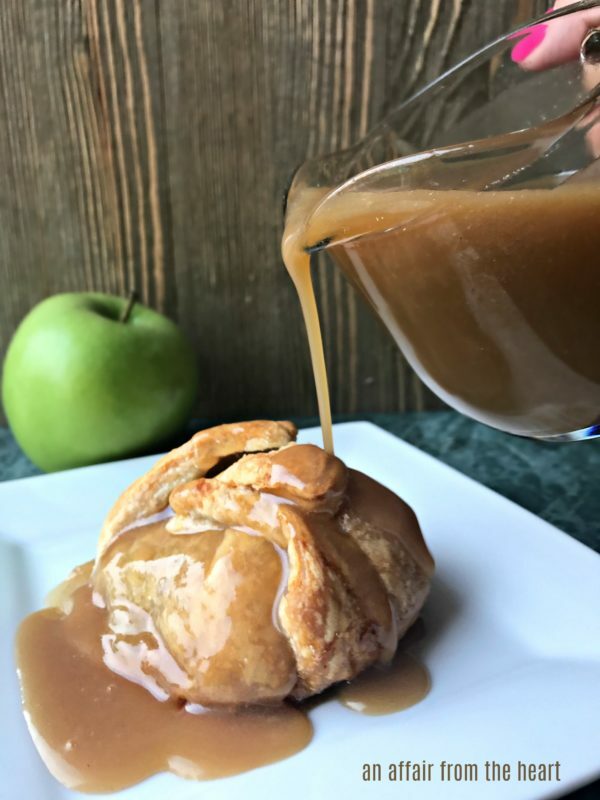 Easy enough to remedy that issue – apple dumplings are going on my must try dessert list! This looks so good! Everything about it, but then you top it with that ice cream and it looks even more to die for! And, I love how easy it is! OMG so delicious! I remember when they had Apple dumplings too! I guess that means I am old? Oh NO!! We are OLD ?!?!?! 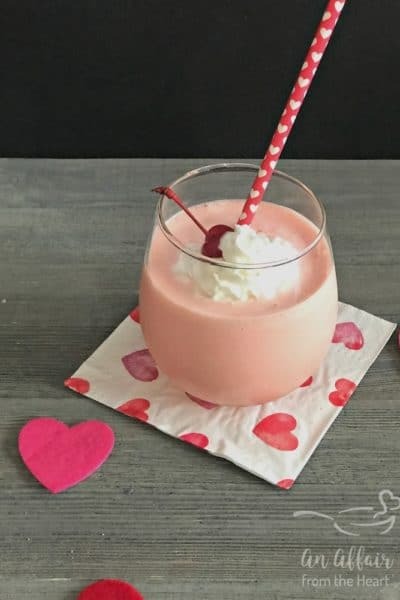 I love that these are delicious but also easy! Apples are the best! I can’t wait for #appleweek and appleseason to make these! So sweet and delicious. I agree, there’s not much better than a great apple! I love traveling to Apple Hill near Sacramento in apple season because they have the best apples and your recipe? 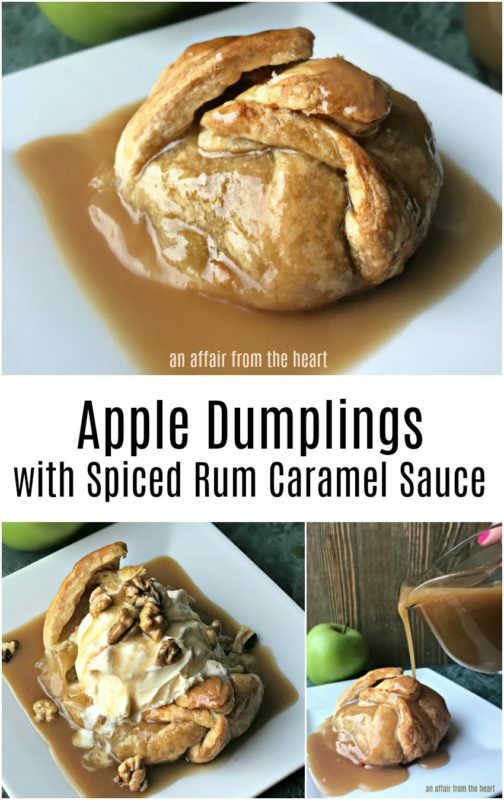 Totally drooling, the dumpling looks amazing and the rum sauce, WOW!!! What an incredible dessert! 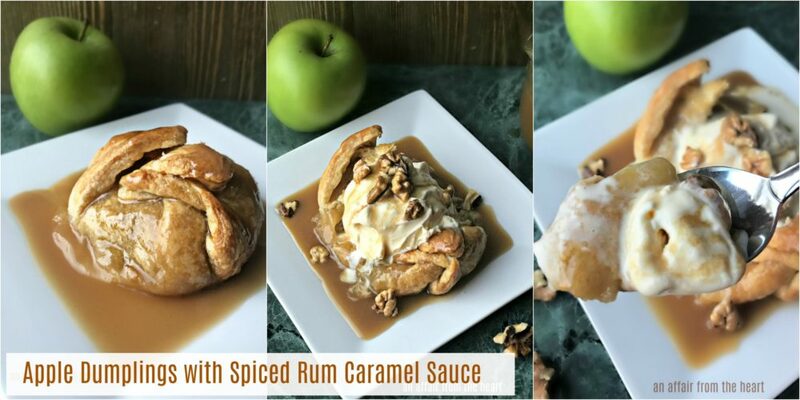 That spiced rum caramel sauce sounds so up my alley!